Everyone needs a fun record to blast in their cars. 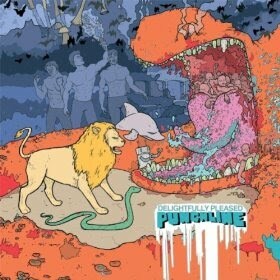 Punchline's sixth record, Delightfully Pleased, is 2010's fun record. The instant you see the wacky album cover, you know you are ready to go on a journey to a magical world, where Punchline fights the Kingdom of Boring Music in order to create a musical paradise for everyone. Through the blasts of their blaring guitars and the pummels of their steady rhythm section combined with slick production, Punchline succeeds at making one of the best pop-punk records of the year. The aforementioned "Seventy" opens the record on a high note. Punchline immediately gets their goal for the album out of the way with the first line of the record. As if you needed more reassurance after the opening statement, vocalist Steve Soboslai states that even after the difficulties he's been through, he's "feeling good right now", adding to the pleasantness running through the record. "Greatest. Party. Ever" contains some of the most humorous lyrics on the album, including references to “Forrest Gump” along with some surprising screams in the bridge. "Roller Coaster Smoke" is another strong point, with a superb hook and a catchy melody. Not to mention the song is about "Lost". "Whatever I Want, Whenever I Want" and "Into The Mouth" indicates that Punchline doesn't need a cookie-cutter formula to create a successful track, moving from simple but catchy pop-punk to an acoustic based jam and a short, Queenesque groove. The closer, "A Universal Theme", is another strong point while reprising some of the lyrics from "No Significant Other". By the end of the record, Punchline has taken back the magical kingdom for music lovers worldwide. That isn't to say the album is perfect. As a pop-punk album, the musicianship is simplistic,and quite repetitive. The vocals can get nasally at times. The lyrics aren't world changing,and often seem immature. However, that is exactly what Punchline has intended to do. This isn't an album for one looking for serious and sophisticated music. This is an album to enjoy while having fun with friends. Punchline wouldn't have it any other way. Listen to Punchline on Myspace here.